Autonomous: charters or administered by the state (the MET). Formerly semi-autonomous: schools which are nominally site-based within the district, but lost all real authority over the past two years, and schools formerly administered by the state but turned over to the district. Not-autonomous: these were always run as regular district high schools, just small. Also, there is a fair amount of conceptual slop here. I've got the six MET schools represented as just one, sized to correspond to the size of one of the schools. It doesn't appear that they release a breakdown of the different sites (which I'd be curious to see). Also, I'd note that standardized test assessments are probably even less relevant in the case of the MET than other schools. Also, if I'm getting this right, in the "testing" year (which I used) there were two Hope schools with 11th grade classes about 130, but in the 2008-2009 "teaching" year there were three schools of 90-ish. Arguably that would be the more accurate representation but unless someone's giving me money or academic credit, I'm not redoing the table. 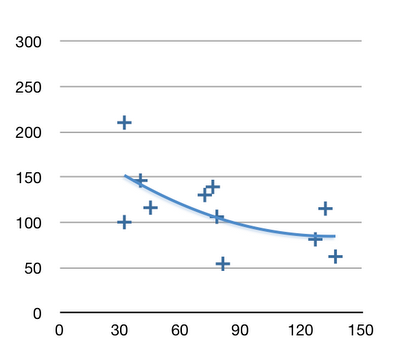 I got a C in statistics (and the data set is small, etc), so I can't do anything too fancy, but I did make a couple of scatter plots and pressed the little polynomial trendline button. The autonomy plot is potentially useful in illustrating why the district's current approach to small schools is misguided. They're working hard to turn the category 2 schools in to category 3 schools as quickly as possible. Also, the overlap between category 1 and 2 is greater than most people would expect. Also, one thing we don't know is how successful a site-based district high school with 30-40 students per grade would be. Especially with "criterion-based hiring." Is there good reason to think it would be less successful than a charter of the same size? For that matter, is there reason to suspect a charter high school with 80 students per grade would be significantly higher performing than the existing (but fading) site-based programs? 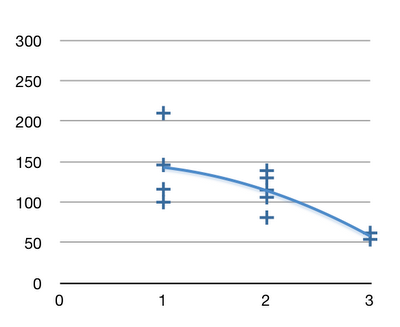 Finally, I've got a bar graph derived from the NECAP "school year" numbers, counting small and large regular district neighborhood schools and using the strict definition of site-based (Feinstein, E-Cubed and PAIS not Hope). This is measuring average proficiency rate across reading, writing and math. Anyhow, this is just a dump of stuff I've been unhealthily obsessing over, so I'd welcome any feedback.